This results in some thoughtfully crafted art, both on the musical and extra musical level, released over a course of consistent and lengthy “career” free from usual flaws and mistakes. In the music of DNS one can immediately hear the same (albeit with a caveat) familiar momentum, undaunted spirit, and a certain triumphalism, which only selected few can ignite in this apathetic epoch and which even black metal almost completely forgot by now. However, it is undeniably modern and fresh like a discrete development on the past. While the band discarded some elements of the genre, it is pushing the other aspects few steps further, providing them with its own, noticeably idiosyncratic perspective. 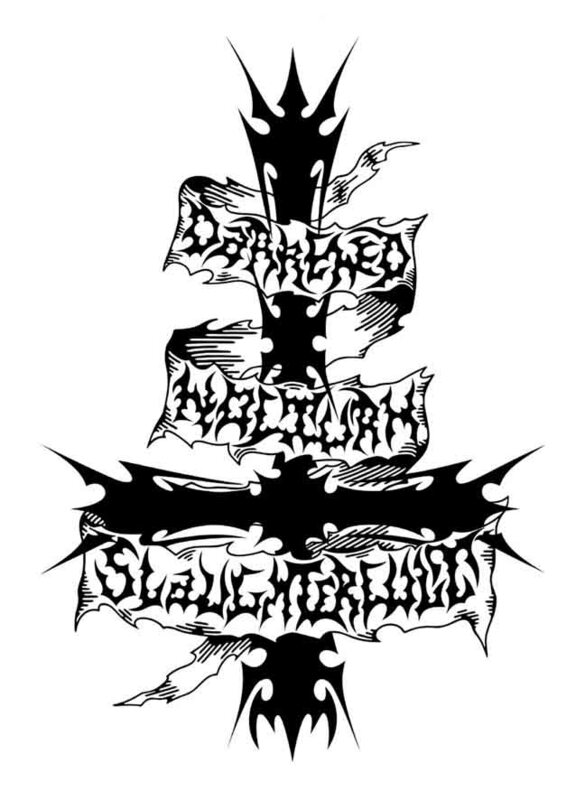 Darkened Nocturn Slaughtercult is like a pact or nomen omen a cult. Even the extra-musical values originally associated with black metal, such as elitism, uncompromising attitude towards the adopted vision or requirement for absolute dedication from the individuals involved, are treated by you with the utmost seriousness. What does the tradition (or Tradition) mean to you, both in metal and outside of it? There is a fundamental law that is actually based on nothing more than common sense. Yet, due to this obvious simplicity this law is most often disregarded. All this law implies is that whatever you do, do it with utmost sincerity and to its fullest extent. Doing something halfhearted means that you are not a hundred percent committed to the cause. Whatever our true will is, it is definitely worth and eligible to receive our absolute focus and dedication. Sincere art is an expression of both the heart and the soul. Both in union result in a deeper understanding of oneself. The opposite would be an illusion. Not more than a charade. This utter honesty concerning yourself is a constant process of self-reflection. Thus, being a constant companion, it applies to all aspects of life. It applies to the artist as well as the one that has a daily job. There is no inside, no outside — there is all and there is nothing. The crown is the kingdom, the kingdom is the crown… and everything in between. Do you agree with the Socratic notion that artists are merely vessels through which something much greater than them channels itself, with often quite limited conscious effort or intent on their part; or, to speak in a broader sense, that we aren’t really masters of “our” ideas, as it looks that it is them who finds us, not the other way around? Do you experience such sensation during writing or when looking back on your music, or do you consider your creative processes to be of entirely different nature? Creativity can’t be forced. The more a person is involved in the ordinary everyday life the more difficult it will be to be creative. Our modern world is more and more constructed to silence free thinking individuals. Of course, some have based their source of inspiration upon this very misconfiguration of society, yet others, those who need distance from everyday life struggles to not drown in the daily bombardment of outer influences. Thus, moments of solitude are the paths that lead to creativity. Let us depict this process as a mirror blank ocean. Whatever thought we cast upon its surface is partially reflected and partially lost in its bottomless depth. This ocean may be called our mind, our conscious- and unconsciousness. The surface resembles the watcher between the two. So, as our mind goes blank our thoughts are skinned. They pass the watcher without judgement. This thought descents further and further down into the abyss. It reverberates and echoes back to us at times. As we have no real understanding of what lies beyond we need an interpreter aka the aforementioned watcher. Yet, this watcher is biased. The interpretation is tainted due to our individual experiences and thought patterns. Therefore, the ultimate goal is to bribe the watcher to look the other way. Our mind needs to receive the original message. Of course, it is not able to cope with it immediately. For the moment all it can do is to reflect it once more. This self-refining message chain resembles the birthing of a “god”. Eventually as this entity is surfacing it has taken a form that our mind is able to cope with in an unbiased way. Depending on the person it is now expressed in numerous ways. It might be as a painting, as a musical piece, as a poem and so on. Looking back to previous albums always raises the question “how did we come up with that”? Art and the beliefs of Darkened Nocturn Slaughtercult are concentrated around the notion of self. Why is self important? Do you consider it to be possessing absolute qualities (that is, affecting yet not being affected, conditioning yet unconditioned; with cause)? Do you treat solidified self as a way to get the most accurate reading of reality, or is the exaltation of “I” a value and goal in itself, regardless of the actual content of it? How can we alter and change our surroundings if we don’t even understand ourselves? Assuming that it is our duty to fulfill the greater work, we must understand that it begins at the lowest level of influence. Reaching for the crown while still being deeply rooted within the kingdom is futile unless we truly understand that everything is already contained within. The process of becoming a whole man is a task that every “star” (every man and woman) should undertake. By solidifying ourselves we are getting less affected by external influences. We are able to filter the superfluous and therefore able to focus on essential matters. Yes, in a way, we are getting a more accurate reading of reality. Self-reflection means going through the heavens and the hells. It is a stimulant to reach higher levels of awareness. It provides a meaning to the seemingly meaningless. Black metal in its most formative years was confrontational, militant and active. It was very open about its aggressive willing to influence reality and its warlike spirituality found its natural reflection in medieval, barbaric (or even totalitarian) imagery, which also Darkened Nocturn Slaughtercult is using. Does the band also share such intent to affect reality on some level through any aspect of its activity or activities of individuals involved in it? Obviously we personally like medieval woodcuts and engravings. Otherwise they wouldn’t have been part of the albums artwork for so many years. Especially as such art is saturated with superstitious and religious believes. Depicting centuries ago and still they perfectly reflect modern life. Every visualization suits the overall impression intended to be implied by the album. It is meant to stimulate the listener on different levels. Imagery tells stories. A soundtrack attempts to push it in a certain direction. Even though the majority would describe it as aggressive and totalitarian, there are few who might called it a romantic approach to describe the foolish conflicts amongst the so called highest of beings. You see, that is what it all comes down to: personal liking. Everyone prefers to be surround be things we like instead of those we dislike. The first has a soothing and the other a disturbing character. Shifting the balance to either one side is potentially affecting reality in a sense that we as humans are, unless otherwise trained, subject to our emotions. 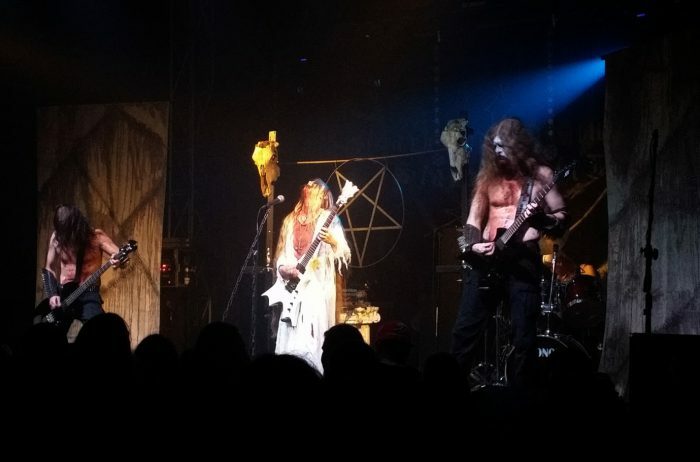 Toward what Darkened Nocturn Slaughtercult takes its aggressive, spiteful stance. To say that it’s solely against Christianity would be serious understatement in case of DNS. Is it meant to express a spiritual, inner war or something on a plane of action? Also, regarding what you said about being inclined toward certain imagery, what constitutes a basis for such affinity between the self and the external? Can we assume that things which resonates with us the most are things most alike us and, in a way, of ourselves? Some years ago the term “war” would have been described in a rather mundane approach. Simply because at that time such thoughts had no time to ripen. “War” doesn’t always mean brother turning upon brother. To wage war can easily be applied to sole inner processes within oneself. Meaning to rise up against your inner oppressor. Such a war is probably the only one which will bring forth something good. The only conflict resolution that won’t be carried out on someone else’s back. So, what constitutes a basis for such an affinity between the in- and external? By understanding what happens within our innermost sanctuary we will also gain knowledge about the exterior. The lesser is always within the greater and vice versa. We are all crowned individuals — yet not all are among the nobles. A king or queen shall only become an aristocrat by realizing what his or her kingdom is. There is no king without a crown and no kingdom without an aristocrat. That is a fundamental law which links the internal to the external. Speaking about deepest beliefs and artistic meanings in a more direct, rational way, Darkened Nocturn Slaughtercult creates some very intimate and hermetic concepts like Saldor or Tulwod (“These realms are mine” from Immortal comes to mind). They are fictional and personal, yet I suppose that they are corresponding to something which is both real and possible to be received more universally. Could you reveal something more about these ideas or visions and the purpose behind such mode of expression? Immortal’s early works are fantastic — that’s something even a certain former member of that band can’t destroy. However, there is a great difference between Immortals fantasy realms — which taking the aforementioned band member’s behavior into consideration, must be a circus — and the neologism of D. N. Slaughtercult. At some point every human language fails to express a specific feeling, emotion, state of mind and so on. Whenever we feel like a regular language can’t justify the value of what needs to be expressed a new word is crafted. This qualilistic approach elevates the meaning by keeping a relation to the original non-justifying word. It emphasizes a stronger conceptional, at times personal, meaning. As it is of little use to know the creative process some light can be shed on Saldor – which as you will see in a moment is not more than a label unless you have to understand the entire context in which it has been used. Saldor is constructed of different syllables or characters taken from different languages having the English equivalent of forest. Their placement is specific as the spoken word has its own rhythm and melody. Some vociferations gain their power from this rhythm rather than their meaning. So, by elevating “forest” to another level it is no longer solely describing a place. It described so much more. It is making abstractions, depending on the context it might be an autumnal or wintery forest. Thus, the neologism could be associated to the color orange or white perhaps silver. Please keep in mind that this short explanation is merely scratching the surface. However, it should more than enough to get the point. The occult is an elusive ability of reading reality (both physical and metaphysical). A gifted individual is able, with unequaled ease, to receive clear, balanced, and somewhat summarizing insight, which differs greatly from those achieved through cumbersome mechanistic and rationalistic methods. Do you believe said ability to be innate and determined, or acquired and basically possible to attain? As every man and every woman is a star we are also all carrying the same potential within us. This means theoretically we are all equal and thus capable of achieving everything everyone else has achieved. Obviously, that is not the case, so there must be something else affecting us. That’s where spiritual development comes into place. Spiritual development surpasses a single life span. Spiritual development can be imagined as a pyramid. At the base there are the most “seekers”. The higher you ascend this pyramid the less “seekers” will accompany you. The base is broad, the soaring heights not. So, those who are seemingly gifted must have advanced to higher levels previously, while those working hard to attain equal skills are situated at a lesser level. Their knowledge is being passed down. It needs to be digested and turned into own experience and knowledge. Do you consider it likely, that said insight in a more organic times was always a trait and true legitimacy of orders misunderstood as oppressive and rulers misjudged as tyrants, who in subjugation of those lacking this quality simply recognized necessary act of life? Is occult reading of reality (under its various names) can be (was?) in fact a good foundation for hierarchy among humans? If not, what according to you can provide such criteria? There shouldn’t be a hierarchy at all. It is a flaw to place yourself above others. There will always be someone who is stronger, more attractive, wealthier, younger, etc. Think about what is causing turmoil in the world? Is it because reasonable minds are at work? Any human hierarchy will spawn envy sooner or later unless those at the very bottom have gained knowledge of the true essence of life. Otherwise materialistic thoughts will dominate within a materialistic world. Those who are privileged to have “an occult reading of reality” should use it to secretly elevate others instead of being mislead by it into hierarchic encounters. The strong and the feeble, the fool and the wise they are all struck down by the sword named jealousy. The only foundation we should build upon is an intrinsic urge. It is referred to as the true will. Darkened Nocturn Slaughtercult is a very idiosyncratic entity comprised of self-initiated into the ways of Insight. As such you don’t follow any specific doctrine strictly, but is any of the established occult traditions or concepts of any merit for you or was especially helpful in creation of your own distinct path? While it is easy to follow in someone’s footsteps, it is nearly impossible to do so in the same manner. Walking the paved road is the easy option. It will lead you to the final destination much faster. In the end you are the first to reach it, yet you have no knowledge of the hard labor it took to pave it. You don’t know how much sweat and blood dripped down and mingled with the tare. Those walking aside the road on small and narrow winding trails might get lost and even walk completely on their own for a while until reaching another path. Such “hikers” see and experience more of their surroundings. Their horizon is broadened. There is not just one single truth. We need to be open minded. We need to take and use what suits our individual approach the best. That is the only way to turn “I believe” into “I know”. We can choose to walk in someone’s shadow or we can choose to be completely exposed to the sun. One has merely heard of the suns power; the other has experienced it – he was burned and marked by its blinding light. However, he now has a better understanding of what the sun is. Do you mean that he is the highest in age, or longest membership in the ‘Cult? How old IS he, and the other members as well? There shouldn’t be a hierarchy at all. It is a flaw to place yourself above others. There will always be someone who is stronger, more attractive, wealthier, younger, etc. He sort of contradicted his point. If someone is always stronger, etc., then there’s a hierarchy.